I love soup! It's so versatile. You can eat it for lunch or for dinner and it's easy to make ahead of time and freeze for later. 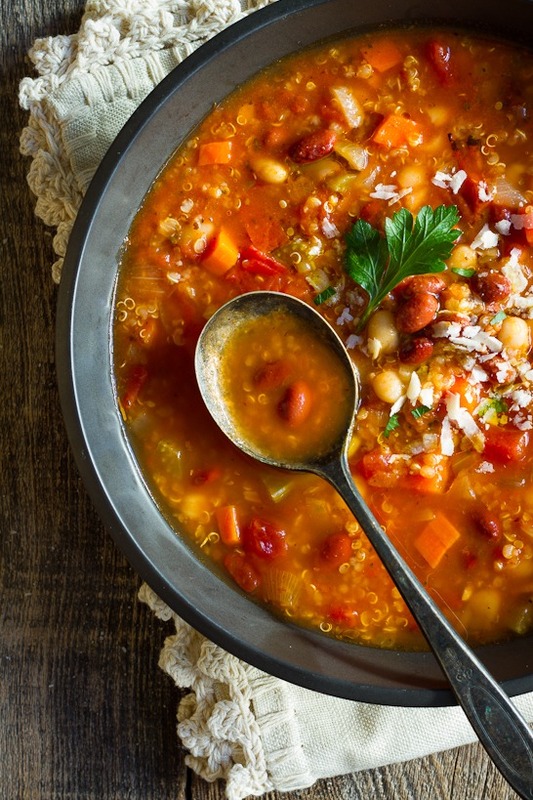 This minestrone soup recipe contains quinoa, which provide the body with amino acids. Add carrots, fennel, onion, garlic, bay leaves, and thyme. Cook, stirring often, until vegetables are tender, about 8 minutes. Add 6 cups water, beans, tomatoes, and quinoa. Reduce heat to low and simmer gently until quinoa is tender, about 20 minutes. Remove bay leaves and add salt and pepper. Stir spinach and basil into soup just before serving. Garnish each with 1 Tbsp. cheese.